A simple vegetable tagine recipe packed with warm Moroccan flavors. One of my new favorite one-pot meals. Vegan and Gluten free! 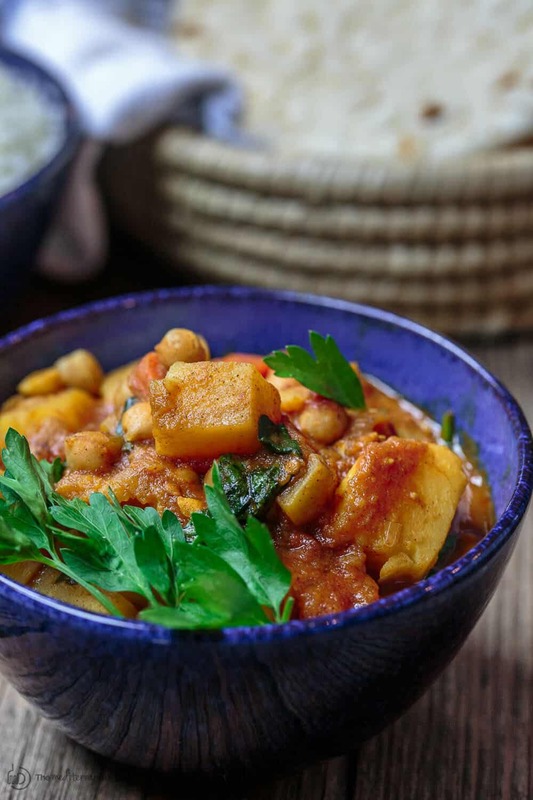 Be sure to watch the video for how to make this vegetable tagine below! Think of Moroccan tagine as a succulent, slowly simmered stew. 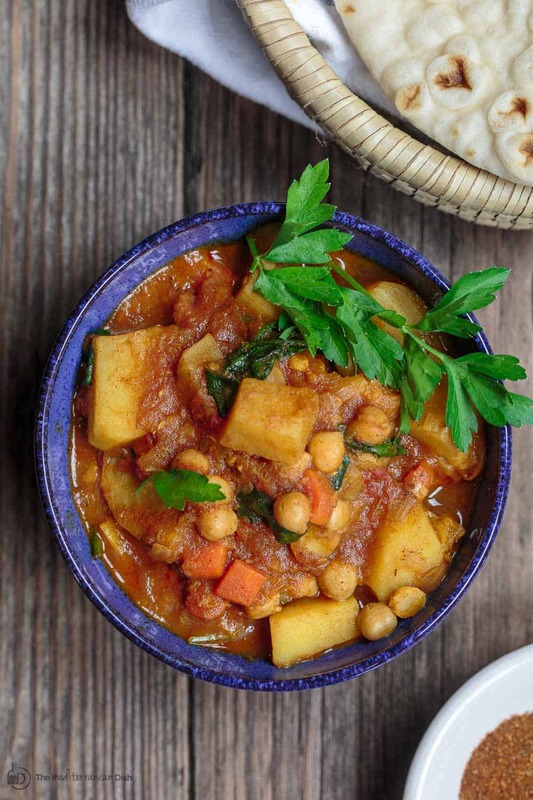 Similar to this Moroccan Lamb Stew, the balance of sweet and savory flavors, coupled with the intensity of spices set this vegetable tagine apart from your average stew. 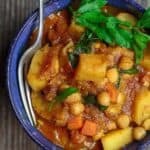 This easy Moroccan vegetable tagine begins with a few humble ingredients, you probably already have: potatoes, carrots, onions, and garlic. A heaping portion of chopped dried apricots, is what provides the subtle sweetness in this hearty vegetable tagine. And to balance it off, tangy tomatoes, and a splash of lemon juice (which is added at the very end to wake everything up). The main spice used in this easy vegetable tagine recipe is a new favorite in our shop: Harissa (pronounced: ha-REE-sah). An all-natural unique blend of three types of chili, along with sumac, caraway, fennel and more! To play up the depth and warmth of harissa spice, I added a little cinnamon, coriander, and a touch of turmeric. Traditionally, tagine is cooked in a clay (or ceramic) pot like this one, wide at the bottom and topped with a narrow, cone-shaped cover. But in this modern improvisation, I simply used my Dutch Oven. All-star vegetable tagine recipe! 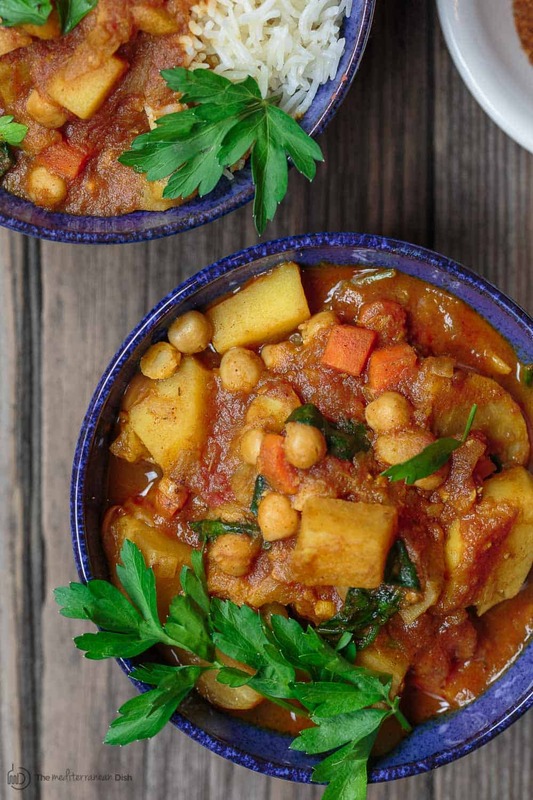 Simple vegetable stew packed with the perfect balance of Moroccan flavors. Vegan and Gluten free. In a large heavy pot or Dutch Oven, heat olive oil over medium heat until just shimmering. Add onions and increase heat to medium-high. Saute for 5 minutes, tossing regularly. Add garlic and all the chopped veggies. Season with salt and spices. Toss to combine. Cook for 5 to 7 minutes on medium-high heat, mixing regularly with a wooden spoon. Add tomatoes, apricot and broth. Season again with just a small dash of salt. Keep the heat on medium-high, and cook for 10 minutes. Then reduce heat, cover and simmer for another 20 to 25 minutes or until veggies are tender. Stir in chickpeas and cook another 5 minutes on low heat. 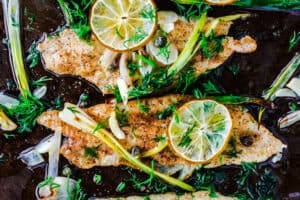 Stir in lemon juice and fresh parsley. Taste and adjust seasoning, adding more salt or harissa spice blend to your liking. 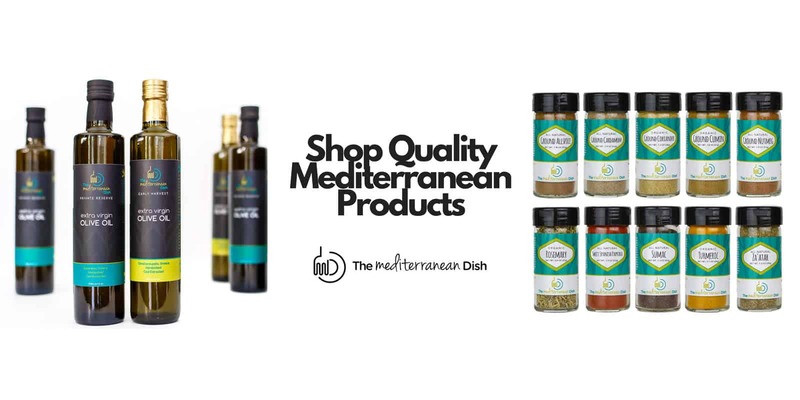 Transfer to serving bowls and top each with a generous drizzle of Private Reserve extra virgin olive oil. Serve hot with your favorite bread, couscous, or rice. Enjoy! 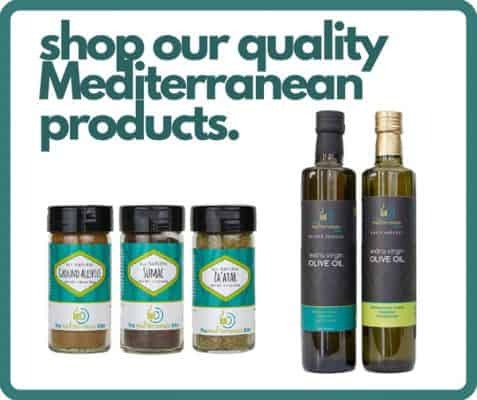 Recommended for this recipe Private Reserve Greek extra virgin olive oil (from organically grown and processed Koroneiki olives). And Recommended from our Spice Collection all-natural Harissa Spice Blend, and organic ground coriander and turmeric. SAVE! Create your own 6-pack of spices! 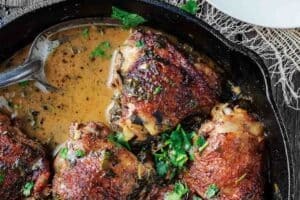 Could this recipe be made in a crock pot? Sure, sherry! I like to give the veggies a quick saute first before adding to the crock pot with the liquid etc. Set on low for 6 to 8 hours or till veggies are tender. This is the first recipe I’ve made from this blog; my husband and I made this tonight with a side of homemade naan. It was incredible! I used an immersion blender on half of it before adding the chickpeas to create a “creamy” texture. I can’t wait to try more of your recipes, thank you! Awesome, Courtney! I am so glad to hear it. And great tip on the immersion blender. WOW! This was superb! Reminded me of my Morocco visit ages ago. Thanks so much for being specific and creative. I wasn’t so sure about the apricots but it’s what made the dish unique. Loved this. My kids did too! And wasn’t spicy! Will be a staple in my house. 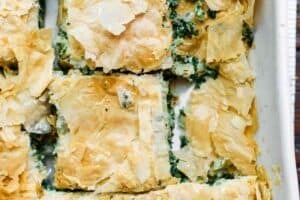 Made this tonight along with some Moroccan white bread,(khobz), and it was incredible. Thank you for sharing. A wonderful dish! Kisses from Brazil! This comes together easily and is very tasty!! Preserved lemons and a dollop of coconut yogurt is a nice topping. 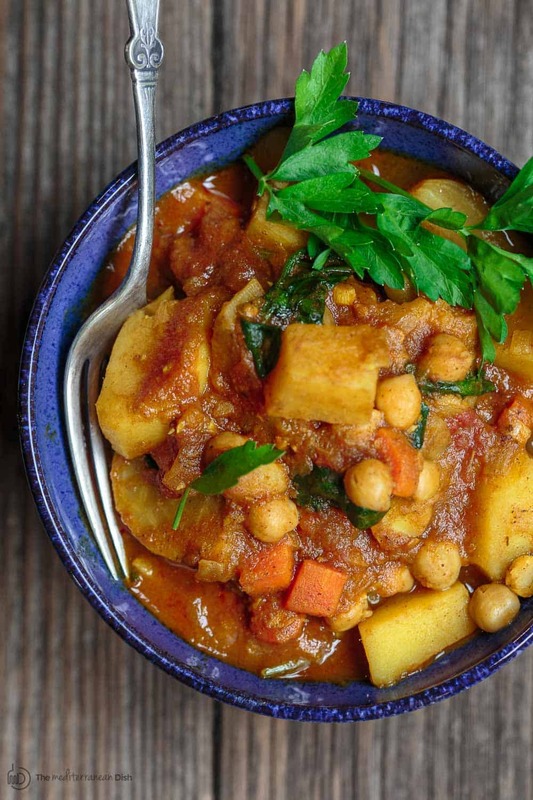 We made tagine last night, pretty much like this recipe though not vegan, in our Instant Pot. 30 minutes cooking and it came out great. But you definitely need to have harissa on hand, and a bunch of cilantro helps. Thanks, Tejano! 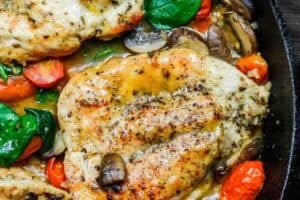 I’m excited to hear you tried this in the instant pot! That’s awesome! Absolutely delicious! I have never tried harissa so I wasn’t sure what to expect, but enjoyed this dish very much. 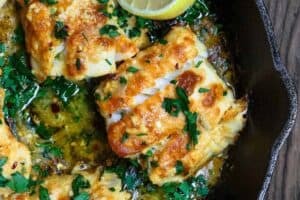 Thank you for all the delicious recipes you post. Your recipes are the best.